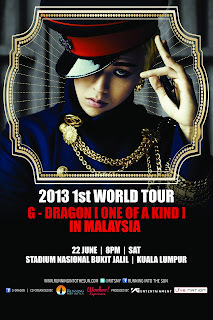 G-Dragon’s first solo concert in Malaysia is just less than 3 weeks away from us now! This event promises a fantastic party atmosphere that only an outdoor concert can provide! It is surely to be a One Of A Kind concert! With Cat 3 tickets sold out, seated categories were no longer available. To cater to those who haven’t been able to purchase tickets yet, the organizers have reconfigured the layout and created a new seated category – CAT 5 RM458. Safety of fans have been highlighted as the utmost priority for the organizers , and the organizers have taken care to ensure that there’s sufficient space in the XZone sections.